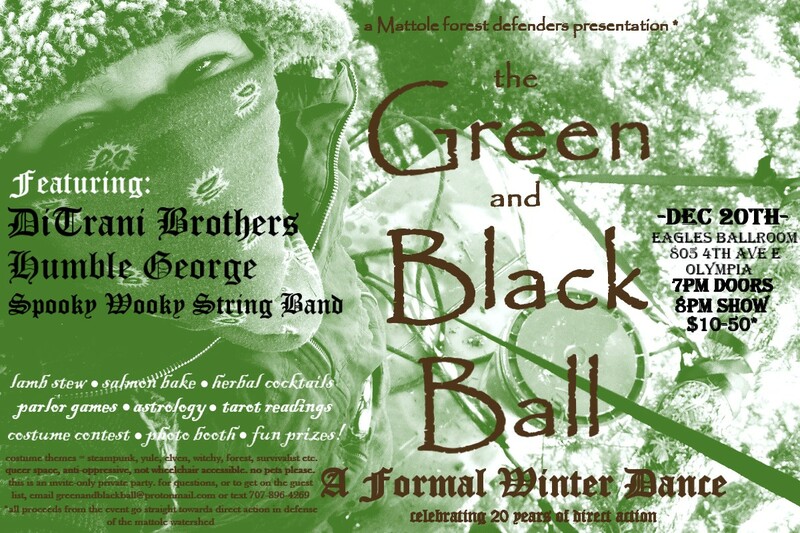 The Mattole Forest Defenders invite you to the the Green and Black ball, a winter formal dance! We will gather on this long dark night to make-merry, dance, bring in the winter solstice, and raise funds and awareness in solidarity with the Mattole Forest Defense, currently happening in the ancient, old-growth Mattole forest of California. “Volunteers are putting themselves on the line to defend thousands of acres of coastal temperate rainforest–much of which is Old-Growth–in the Rainbow Ridge area of the Mattole River. Since the 1990’s, nonviolent direct action has been used to protect this ancient ecosystem. In 2014 a new wave of logging began, but was quickly stopped with the renewal of tree sits and road blockades. These actions have helped to cancel over 800 acres of planned logging. Additionally we have assisted in the mapping of previously unrecognized Old-Growth groves, a necessary first step for advocacy and protection. Despite our accomplishments, the timber companies are pressing forward.